Eva Montrilla Rancier, formerly of Blackwell, Oklahoma, died Tuesday, January 2, 2018, in Wichita, Kansas, at the age of 81 years. Eva Montrilla Rancier was born on September 12, 1936, in Jacket, Missouri, to Alvie Lee and Cecil Montrilla (Pendergraft) Bray. She grew up in Missouri until the age of twelve when the family moved to Blackwell to make their home. She married Marvin Lee Rancier on September 13, 1952, in Blackwell and they settled in Braman for six months. They then made their home in Great Bend, Dodge City and Liberal, Kansas, before moving to Wichita in 1963, where she continued to serve her family as a homemaker. In 1974 she began working at the Plaza West Deli until 1988 when she began working in the Wichita Canteen until her retirement in 2003. Her husband preceded her in death on August 2, 2014. 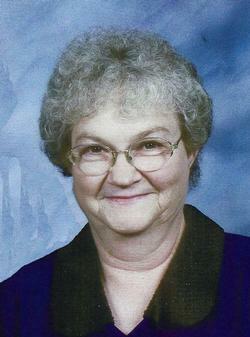 She was a member of the Believer’s Tabernacle and the Ladies Prayer Group in Wichita. She enjoyed embroidery and working jigsaw puzzles. She is survived by a son, Alvin Rancier of Blackwell; two daughters, Sharon Lakey of Park City, Kansas, and Norma Jones of Wichita, Kansas; a brother, Ronald Bray of Blackwell; four sisters, Mildred Wilson of Blackwell, Bonnie Buxton-Gingerich of Newton, Kansas, Wanda Beck of Blackwell, and Cleta Skaggs of Ponca City; eight grandchildren; seventeen great grandchildren; and four great great grandchildren. She was also preceded in death by her parents; a brother, Arlie Bray; and two grandchildren, Dwayne Jones and Christina Glenn. Services are scheduled for 11:00 a.m., Saturday, January 6th in the Roberts and Son Funeral Home Chapel in Blackwell with Rev. Bobbie Massey of Believer’s Tabernacle officiating. Burial will follow in the Blackwell Cemetery. Casketbearers will be Christopher Lakey, Jeremie Rancier, Justin Rancier, Aaron Rancier, James Gallardo and Nathan Gallardo. Serving as honorary casketbearers will be Andrew Lakey, Douglas Murray and Cody Verbeck. A memorial has been established in her honor with Believer’s Tabernacle in c/o Roberts and Son Funeral Home, 120 W. Padon, Blackwell, Oklahoma 74631.